In order to electronically verify e-filing using Aadhar OTP, first we need to link the Aadhar Card with the Income Tax Return. Step 1: First login to Income Tax Department e-filing website (https://incometaxindiaefiling.gov.in/). Step 2: After login, go to Profile settings menu. After this, click on “Aadhar Linked to PAN” link, and enter your Aadhar number. Click on link Aadhar as shown in Figure 1. Step 3: Navigate to e-file in the main menu and click ‘e-Verify Return’ as given in Figure 2. Step 4: The following screen (Figure 3) will appear. Click on ‘e-verify’. 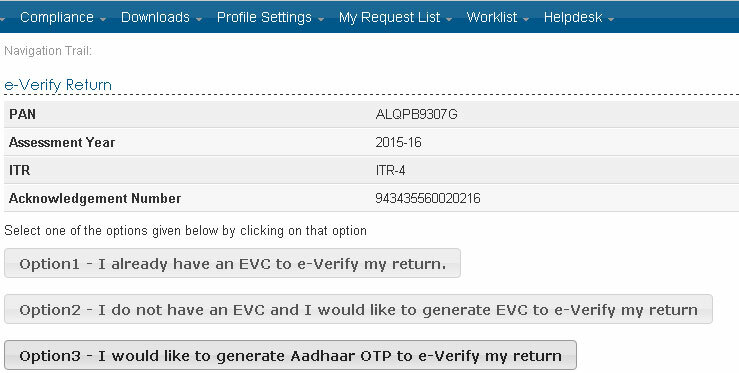 Step 5: Now select ‘Option 3 - I would like to generate Aadhar OTP to e-Verify my return’ as shown in Figure 4 below. After this you will receive OTP in your mobile number that is registered with your Aadhar Card. Step 6: On next screen, enter your Aadhar OTP in the provided place. This will verify e-filing of Income Tax Return. Step 7: You will see Success message as given in Figure 5 and no further action will be required. Now, click on the link to download acknowledgement. With this, you are done with the process of electronically verifying e-filing using Aadhar OTP.